This article describes the inner structure and organization of the elements which build the RadMultiColumnComboBox control. 1. 1. RadTextBoxElement: represents the editor element. 1. 2. 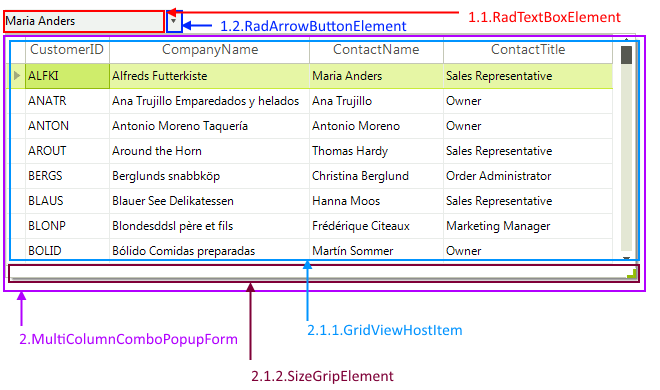 RadArrowButtonElement: represents the arrow primitive. 2.1.1. GridViewHostItem: hosts the pop up RadGridView. 2.1.2. SizeGripElement: represents the resizing grip. The drop-down element is an object of type MultiColumnComboBoxElement. Use this element to set the drop-down style, animation and sizing as you would do for the regular combo box. 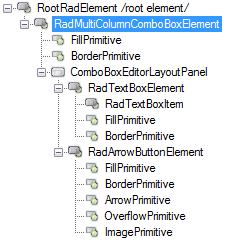 The EditorControl property of the RadMultiColumnComboBoxElement gives you a reference to the RadGridView control. 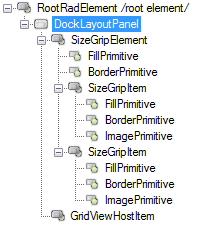 Using that reference you can obtain the RadGridView object and work as with normal RadGridView control. Refer to the RadGridView documentation for additional information on RadGridView.